Despite living in the same three-flat house in the suburbs of London, the residents are strangers to one another. The bottom floor is home to Tam, a recent ex-cop who spends his days drowning his sorrows in whisky. On the middle floor is Nick, a young man with Asperger’s who likes to stick to his schedules and routines. The top floor belongs to Karen, a doctor and researcher who has spent her life trying to understand the rising rates of autism. 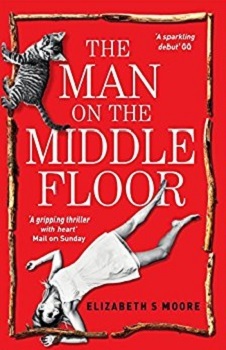 They have lived their lives separately, until now, when an unsolved murder and the man on the middle floor connect them all together. 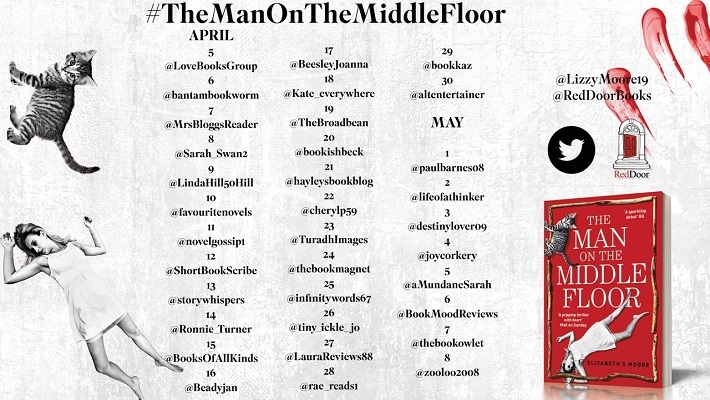 Told from three points of view, The Man on the Middle Floor is about disconnection in all its forms; sexual, physical, parental and emotional. It questions whether society is meeting the needs of the fast growing autistic section of society, or exacerbating it. The Man on the Middle Floor is told from the perspective of the three main characters who all live in the same house in London that has been converted into flats. Nick is a young man who has Asperger’s. He is learning to live independently. He has a weekly schedule that he tries to stick to, and has just gotten his first job working in a hospital morgue. He is afraid of his Grandfather and has sexual urges that he tries to keep at bay. Karen is a middle-aged woman who lives alone on the top floor of the house. She is a researcher at the hospital looking into the increase in Autism diagnoses. She is career driven, so much so that she left her husband and her three young children to focus on her career. Tam is a middle-aged man who has very recently became an ex-copper. He was shot in the leg a while back and was hoping to return to active duty but the powers that be didn’t see him fit to be out on the streets anymore, he’s an ‘old school’ police officer and not what the force wants anymore. He has taken a liking to alcohol just to get him through the day. These three people have all live in the same house for a while, never knowing one another. Their lives were once separate, now they have become intermingled. The book both interested me and shocked me at the same time. The book isn’t really a thriller as such. Yes, there is a murder, but we know what happened and how. The book is more about the lives of the three main characters, focusing mainly on their flaws. It covers lots of subjects including many that are dark and taboo – there’s even some form of necrophilia. There is also some swearing and sexual references throughout from all the characters. All the subjects are well written and executed well. I can see some people being uncomfortable with a few of the scenes. But that is what makes this book a good read, it takes you out of your comfort zone. My only concern is how Nick is preserved. People on the autism spectrum seem to get a lot of flack and are easy targets sometimes. I thought that Nick came across as your stereotypical person with Asperger’s. However, having a teenager on the spectrum, I know a lot of what is written about the condition is not true. I can’t really say it opened my eyes to the world we live in, but if you don’t know anyone on the Autistic Spectrum, then it will open yours. The book is entertaining and moving in part. I thoroughly enjoy it and I read it in just two sittings. This is going to be one of those books that starts conversations and would be great for a book club to read and discuss. Elizabeth S. Moore has worked as a journalist since she won the Decanter Young Wine Writer of the Year at seventeen. She has written columns and articles on restaurants, politics, South Africa and all things foodie. She comes from a family that has given her a lot of writing material and is currently finishing her second book, having written the first after completing the Faber Write a Novel course and being approached by fourteen agents after reading an excerpt of her novel to industry professionals. Elizabeth lives in London with her South African husband and has three daughters and a son as well as two lazy Labradors. You should definitely give it a read, it is well worth it. Sounds like an interesting storyline, and the characters backgrounds make sense enough to connect at a certain point. I will keep it in mind! It certainly has an interesting storyline. Be great to hear your thoughts if you get around to reading it. I was just reading about this one on Netgalley! It is a good read as long as you’re not easily shocked. This sounds good. Thanks for sharing your review. Great review, now I do love when I read a book out of my comfort zone but I don’t know if this book is for me or not. But I might check it out one day and see if I like it or not. Thank you so much for sharing your awesome post and putting this book on my radar. Your welcome. Agree sometimes we need to read books that take us out of our comfort zones. Did you ever get the book on Netgalley? If so what did you think? This one sounds like a book I’d love! Wonderful, I hope you get to read it sometime.